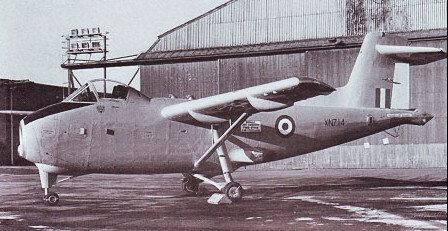 The Hunting H.126 was a one-off single-seat research aircraft with fixed tricycle landing gear designed to test the effects of directing the jet exhaust air across the flaps and control surfaces to increase lift, or as they were known in Britain, "jet flaps". The exhaust efflux of a turbojet engine is ducted to the trailing edge of an aircraft’s wings and ejected through a narrow slit along the trailing edge. As well as being used to provide propulsion, the efflux can be deflected downward to form a “jet-flap” of high velocity gas which makes possible the achievement of lift coefficients of 10 or more. The shoulder-level wing featured a set of struts, not for support but in order to provide piping for the compressed air used in the blown flaps. A maxi­mum of 60% of the jet exhaust can be directed to the wings and a further 10% to reaction jets in the tail and wingtips. 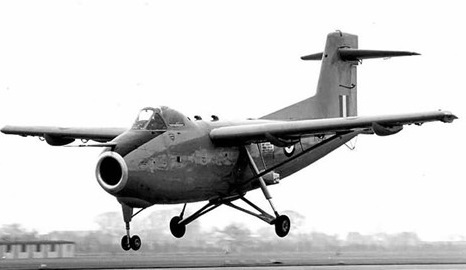 The H.126 first flew on 26 March 1963, being flown in a series of one-hundred test flights at the Royal Aircraft Establishment's Aerodynamics Flight at RAE Bedford by mid-1965 with the program ending in 1967. After two years storage it was sent to the United States in 1969 for wind tunnel testing by NASA returning in May 1970. Stored for another two years it was struck off charge in September 1972 and eventually made its way to the RAF Museum at RAF Cosford. A notice inside the cockpit reads “The airspeed must not fall below 28 knots”. Powerplant: one Bristol Siddeley Orpheus turbojet.